Polly Peabody adores her magical farm, where rhubarb tastes like chocolate, her best friend is a plant named Harry and it rains precisely at one o'clock... until the day it doesn't. And once the rain shuts down, so does everything else, it seems: the Umbrella Ride breaks, Polly's beloved Aunt Edith turns against the family, a green mist spreads across the lake-that-drowns-no-one and Polly's older brother falls gravely ill. It's up to Polly to find the connection between herself and her farm and possibly save her entire livelihood from ruin. MGs always have the most gorgeous illustrated covers. Period. These colours are eye-popping and personally I adore the illustration style. However, the title font is too unreadable IMO; I can see why they'd go for it, though. With "drizzle" and all, yeah? It's the talking communicating plants and talking spelling insects that always get me. 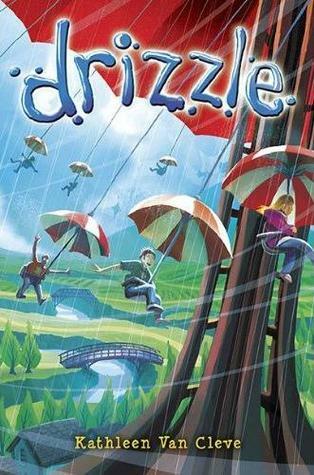 Drizzle is infused with the kind of magic that makes its reader young again. Possibilites abound in the farm where the luminous, imaginative setting is skilfully offset by Polly's memories, both sad and happy, of her grandmother, along with a few choice flashbacks to lay the farm's background into the story's foundation. With the setting and its importance in place, we turn our attention to Polly. A marvelously real gal, she appeals to our sympathies in the best way, as she talks of her own isolation, her "weirdness". It's her quirks that make her so likeable, in fact; we've all been that weird girl or boy, ostracized by the rest of the world. Basford is a fabulous secondary character. He's not exactly a foil to Polly, as they're both shy, but their interactions are authentic and also helpfully illuminating. Best part? No romance. (I'm starin' at you, Savvy by Ingrid Law.) As well, the whole family is shaded in 3D: the father's scientific research; Aunt Edith's deliciously ambiguous intentions; siblings Patrica and Freddy adding comic relief and drama, respectively. The line of the plot is a straight line downwards -- not in terms of interest level, but in terms of direness. It's a steady stream of bad news, which makes the plot less than interesting; this means Polly receives bad news repeatedly rather than her actions triggering higher stakes, so it's a good thing we've already decided to like Polly. 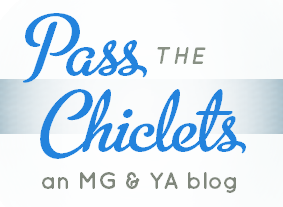 A twist on the ending -- a magical one, of course -- ensures readers will emerge equally satisfied and happy.